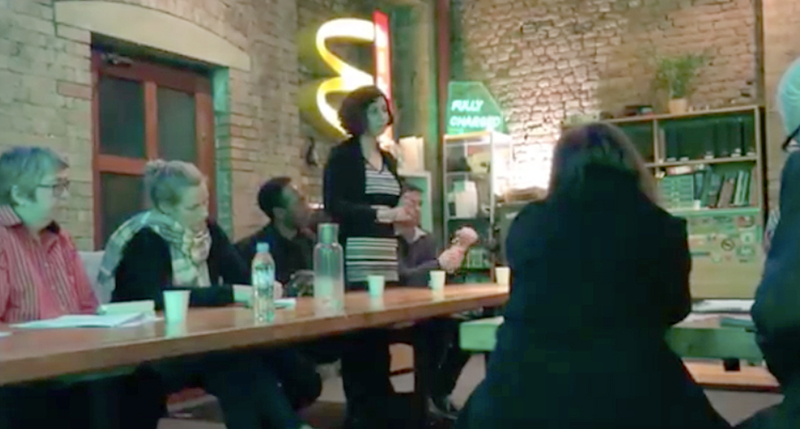 The London Bridge and West Bermondsey ward election was postponed because of the sudden death of the Conservative candidate Toby Eckersley. The final composition of the council will be determined by the delayed result in our ward. It is set to be closely contested between Labour and the Lib Dems. Labour have already increased their large majority from the 2014 election. 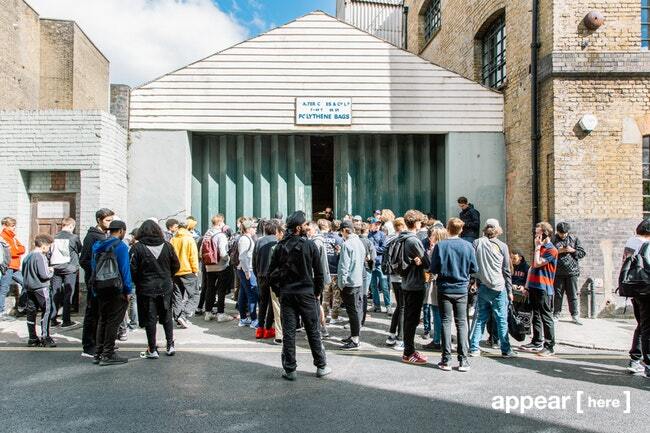 Click here for details of the results as reported by SE1. 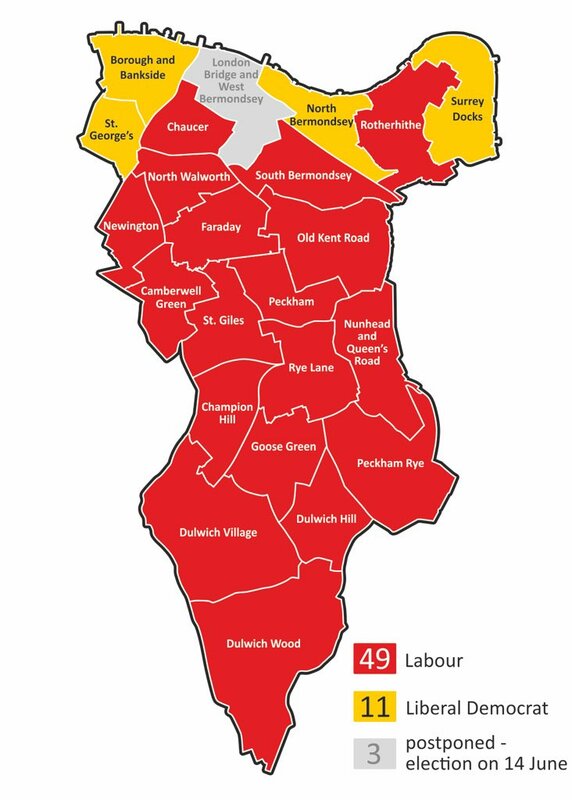 For the first time since 1965 Southwark Council has no Conservative councillors and the Lib Dems have lost their East Dulwich seats, giving Labour a clean sweep south of Elephant & Castle. With such weak opposition the run-away gentrification, social-cleansing and heritage-insensitive planning policies of Labour leader Peter John are only going to be emboldened. The only prospect of a modest improvement of the feeble opposition in our remaining poll is success for the Lib dem candidates. 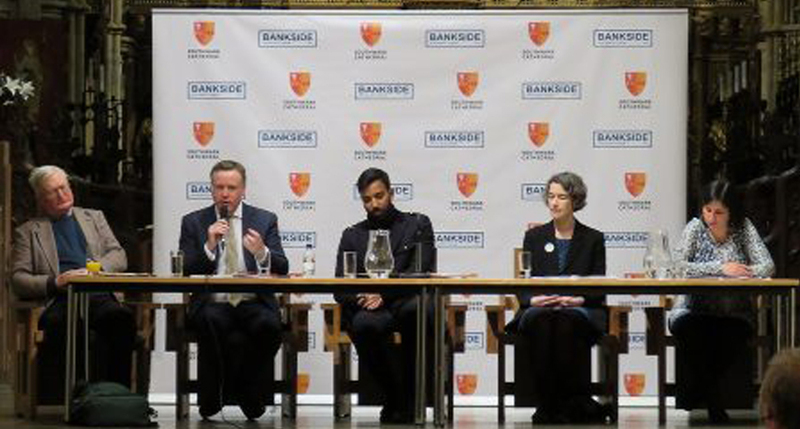 Following the Southwark party leaders hustings the Forum were invited to submit further questions to the panel. You can see our questions and the answers given by the Lib Dems, Greens and Conservatives in the links below.Labour’s Peter John did not answer the questions – despite, for example, the great disparity between his claims about on-site affordable housing and the reality on the ground. We are inviting John and his local ward candidates to the meeting to answer the questions and state their position on planning and new development issues: on-site affordable housing, meaningful local consultation, heritage, and neighbourhood planning. We hope you will be able to attend this important meeting ahead of both the local ward vote and the close of consultation on the Quill++ application (details below). At over five hundred feet, if this tower fell over it would span from its St Thomas St. Capital House site to Snowsfields Primary School. 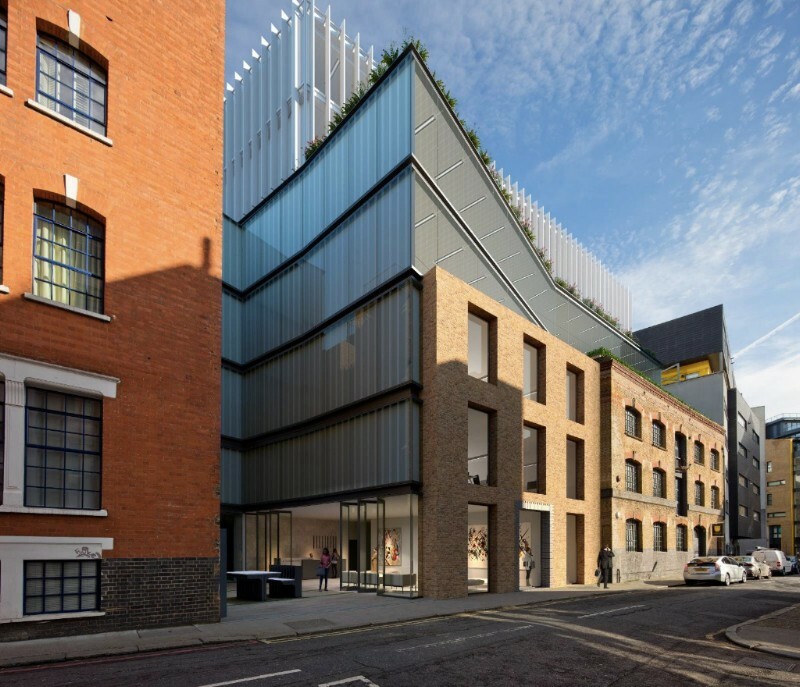 Comments can be made on the Quill++ Planning Application 18/AP/0900 until 27th May. Please click here for full details. 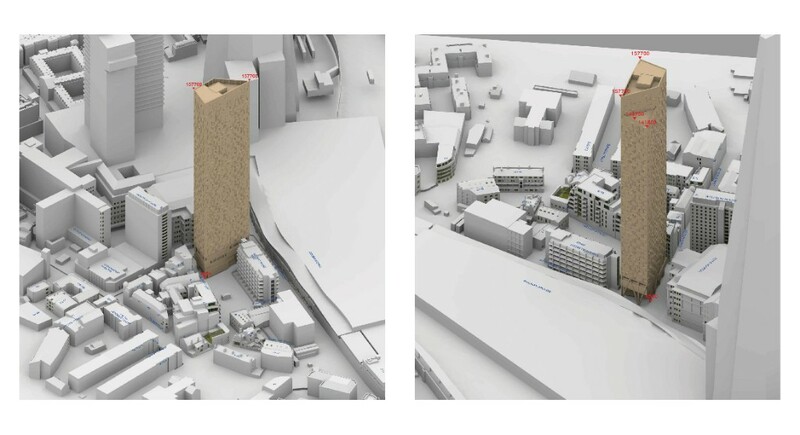 The below truncated images (to which we have added the cropped out bit) are taken from the “Townscape and Visual Built Heritage Assessment” section of the submitted documents. The application contains one hundred and thirty six files in total, sixty four of which constitute the Environmental Statement alone. 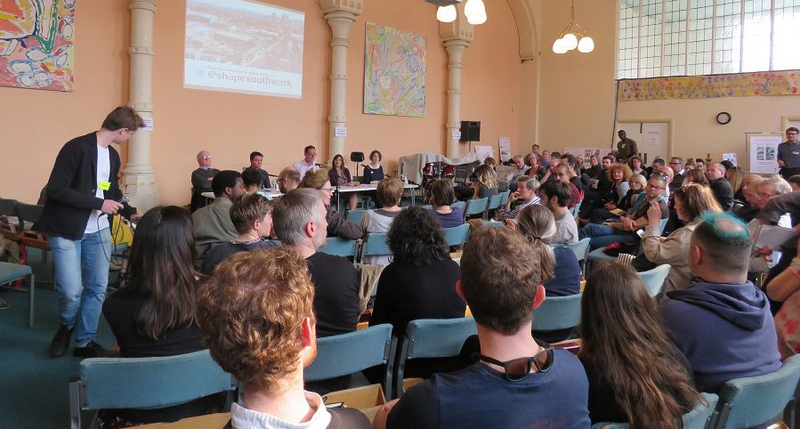 The upcoming meeting will give an opportunity for a full discussion of the proposal, it’s potential impacts upon the area and how we can best mobilise to resist such anti-social development – and the domino effect of similar schemes that we know are being cooked up with the Council for St Thomas Street. 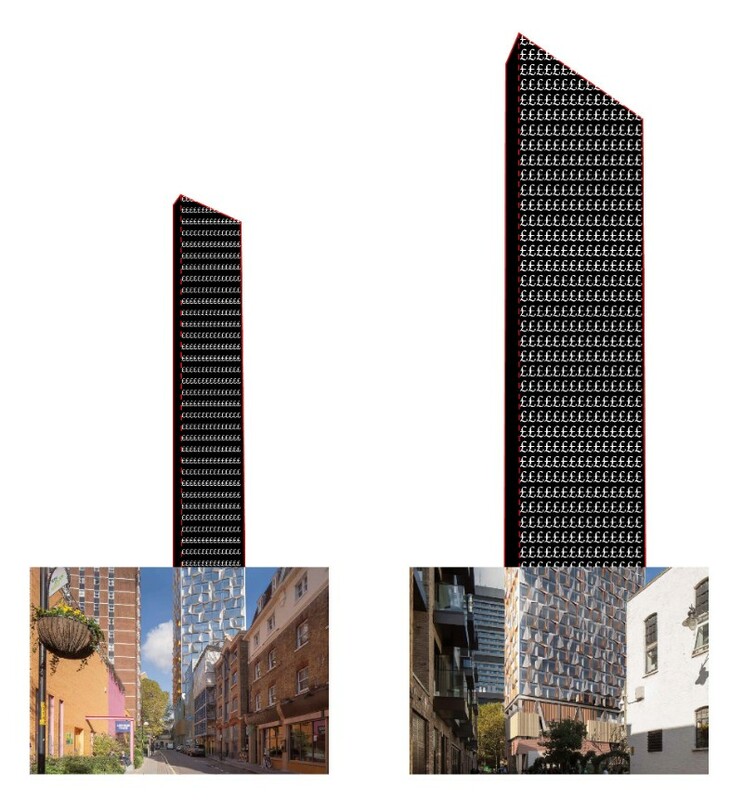 At 45 storeys and 157m high the tower represents a 50% increase in height over the site’s previous fantasy student scheme, the Quill Mk.1. It ups the proposed student population of the building from 500 to over 1000. 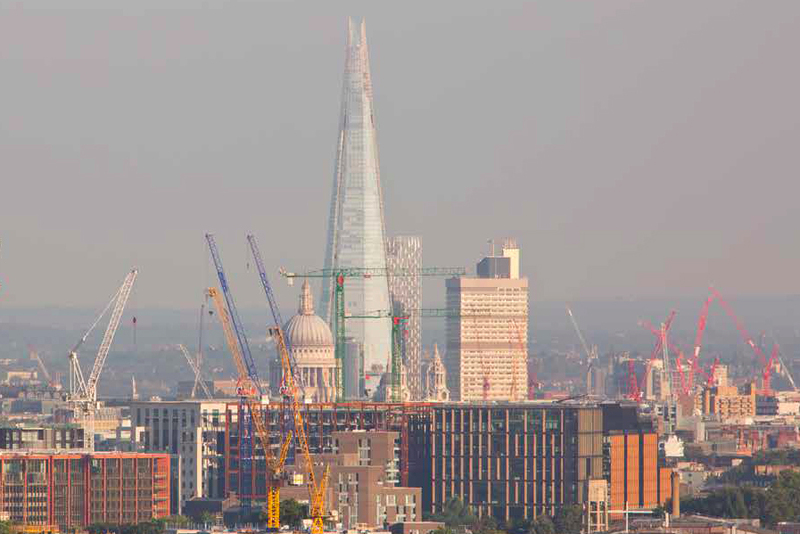 The proposal affects the backdrop of St Pauls as seen from Parliament Hill (a supposedly key view in the ‘London Views Management Framework’) to a much greater extent than did the previous permission. This is clear to see from the image below. We are currently seeking clarity from the GLA over the advice they gave the applicant on this subject. Click here to see informal comments from an (as yet) unnamed officer which we recovered recently through an FOIA request. In terms of local impact, the council’s official Pre-Application Advice Letter of 8th March stated that the proposal was “oppressive and overly dominant as a direct result of the excessive height” (full quote given below). This advice was ignored by the applicants who submitted their proposals just 12 days later with an increase (rather than any reduction) in height. We are yet to establish whether this was just window-dressing by the Council (who knew we would be calling for disclosure of the pre-application advice) with a wink to the applicants that they didn’t really mean it. In the same letter the council waived through the proposal to provide 0% affordable housing on site. 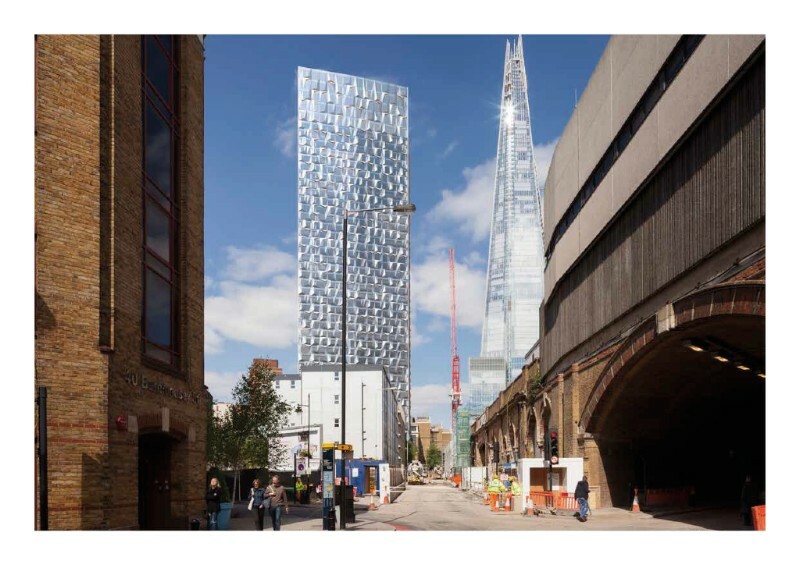 This is contrary to policy 4.4 of the Local Plan and Policy 3.12 of the London Plan and indeed in direct contrast to the passionate claims and pledges made by the recently re-elected leader of Southwark Council, Peter John, during the local elections. In doing so the council planners were passively swallowing an extremely questionable argument put forward by the developer (and their architects), hinging on the idea that the proper functioning of the proposed Migration Museum at ground floor level would make it impossible to provide an entrance to anything but one thousand and twenty eight student rooms above. This argument is summarised in the Planning Statement (please click here pages 35-40) however the pre-app advice letter from the council referred to some recently submitted “further detail”… typically this does not appear to be included in the application, however we found it to comprise (also recovered through FOIA) a study by KPF Architects and an accompanying letter from planning consultants DP9. We can discuss this at the upcoming meeting however anyone interested can click here and have a quick look at pages 123-157 inclusive. This key study by the architects was not available when we requested to see it at the developer’s “consultation” exhibition in January – even though on-site affordable housing was already well off the table. Please click here for the page on Greystar’s website where you can view the exhibition boards. If you search for “affordable housing” you will find it appears once, towards the bottom, preceded by the word “off-site” and followed, almost unbelievably by the phrase “for local people”. Everyone knows, most of all Peter John, that they can’t make the kind of money out of the desecration of the historic environment in London Bridge that the developers want in order to offer a good share of the booty to the Council. Greystar, DP9 et. seem to have disregarded the Council’s request at pre-app that a “full Viability Assessment and a separate Executive Summary is submitted in accordance with the Councils Development Viability SPD”. The Executive Summary included in the application – which points to a “circa £14m towards affordable housing” – appears at a quick tally to have a £30m hole in it. To report to the meeting any avid reader with an appetite for scrutiny of the Environmental Statement documents and its (invariably specious) justifications would be greatly appreciated. The images below are extracted from Appendices 16.1 Daylight and Sunlight Drawings. 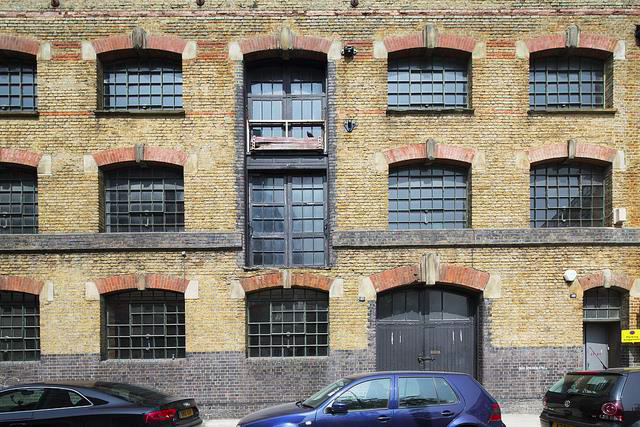 The imposing Victorian warehouse on 47-49 Tanner Street has been under threat for years. We called upon Historic England to list it a couple of years back but they are now under strict orders from central government to moderate their expectations as to what should be preserved; it would have met the criteria when governments valued heritage more a decade or two ago but it doesn’t now. Please look at and comment on the current application, 18/AP/0896. 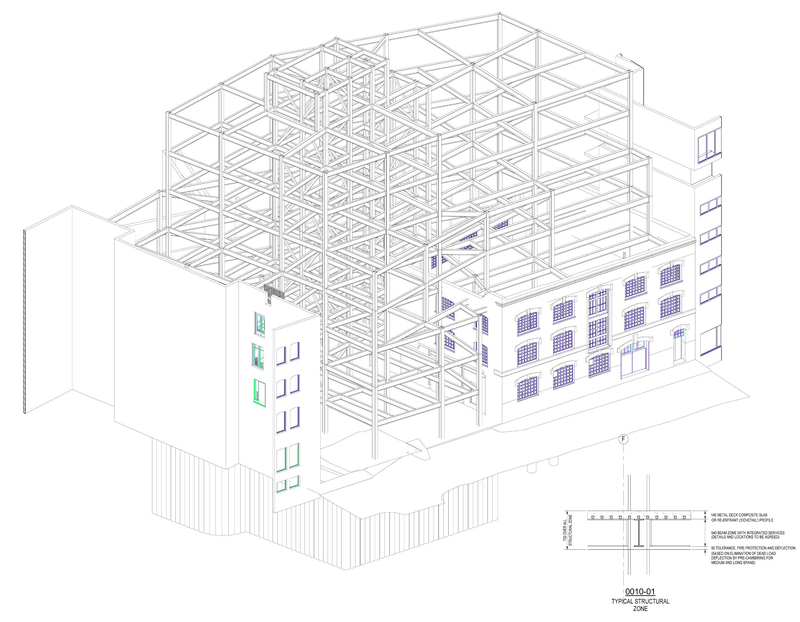 Brunel Planning (sic) on behalf of Jersey-registerd Cetza Trustees are proposing to demolish the historic fabric including the whole of the characteristic floor structure of the building, retaining only the main facade and building up to 7 storeys behind, over and around it. 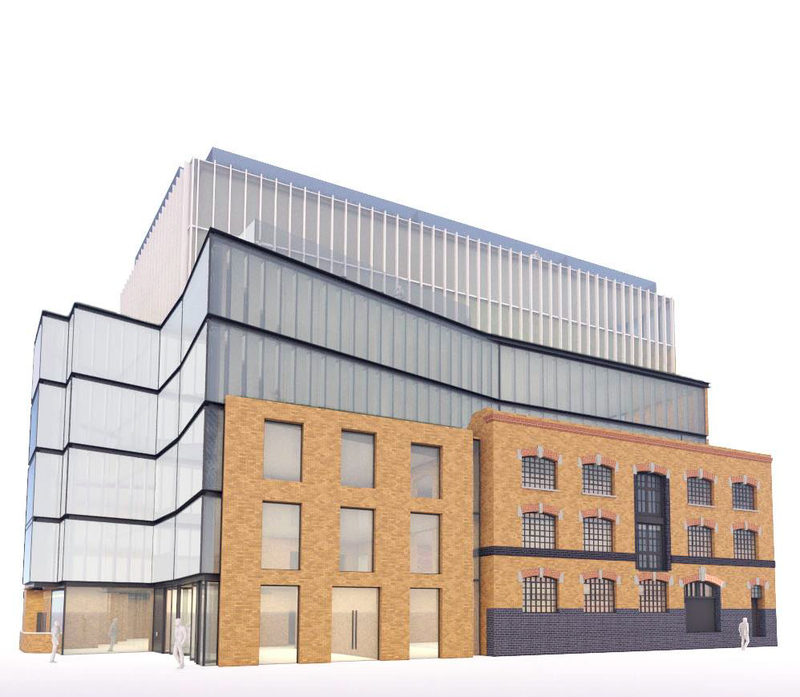 The overwhelming new-build element will create an architectural nonsense: A caricature of the prevailing Council attitude to heritage announcing that they can’t quite get away with total demolition but very much wish they could. The Jersey-based owners usually means they are looking to avoid capital gains tax when, having got planning to jack up the site value, they sell it on unbuilt. A subsequent buyer will then be able to go to the Council with the argument that the original facade alone is a comic token retention that is incongruous and historically meaningless now robbed of its context and interior. The planners will agree and the next proposal will complete the total demolition of the original. Click here for full details of the application. 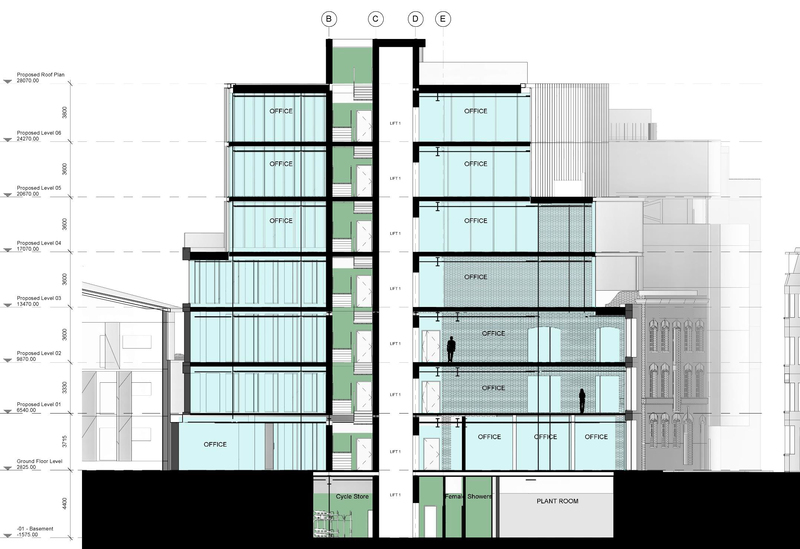 The Design and Access Statement, from which the above images have been extracted, also presents the existing building in a poor and vacant state. 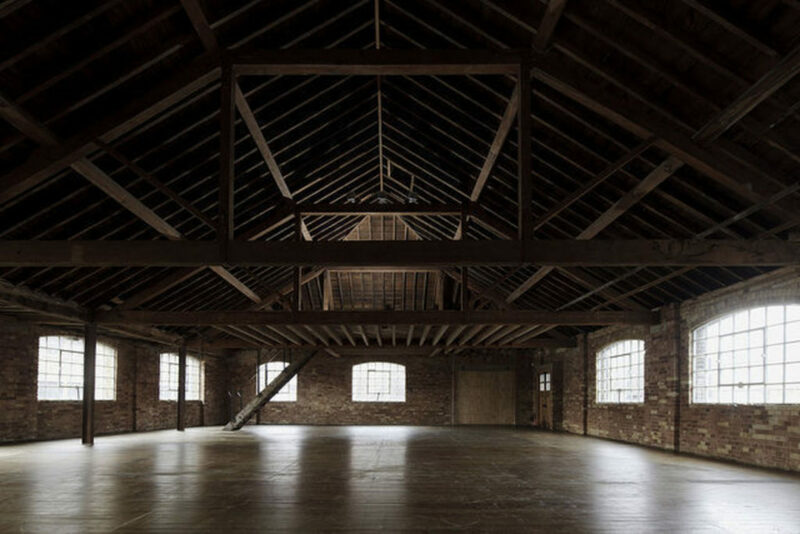 This is of course nothing to do with the viability of an honest restoration of the building – which is unquestionable. It is calculated to enable the Council to tick one of their heritage destruction criteria boxes. Click here to see the existing building as it is presently being used by short-term tenants, Ugly Duck.